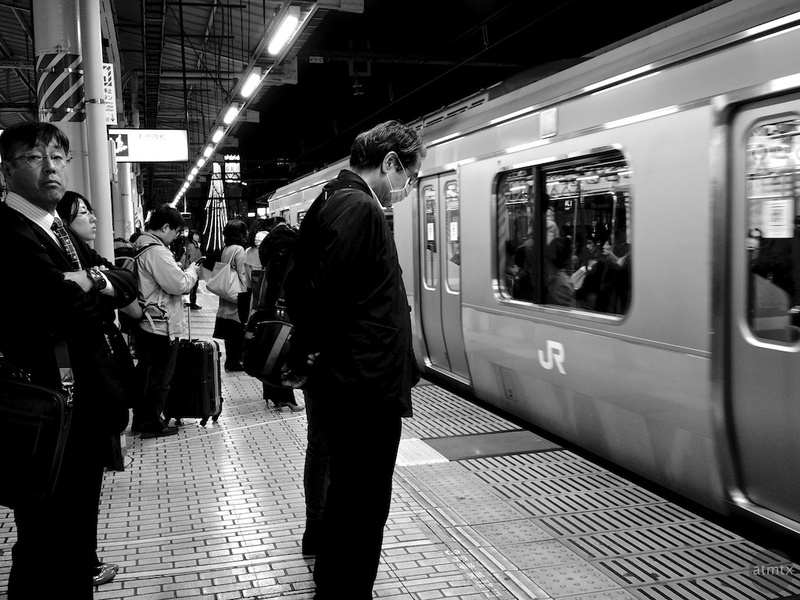 Tokyo is a such a wonderful place for an urban photographer, both for architecture, as well as street photography. However, it’s one thing to vacation there for a short time, but completely different to live and work there. I see it in the eyes of the people on the streets and in the trains. They look tired, beaten down and they sleep whenever they can. In the biggest city in the world, even with an efficient transportation system, it’s draining. The constant flow of people, while exciting for short stay visitors, it’s a different story for the residents and especially the workers. I remember when I lived in New York City. There is a tremendous drain of energy. You feel tired, down to the bone, on occasions. Not for doing anything special, but just going through daily life. The city saps your energy and also from the millions who live there. Perhaps that why the city itself has a lot of energy. It run on the life force of the residents. I would love to shoot NYC. It’s another fantastic place for photography, like Tokyo. But I have no desire to live in those two places. While Austin isn’t a top spot for photography, it’s a great place to live. On the whole, it gives me more energy than it takes away. The friction of daily life is lower here and that gives me a chance to make a living and still actively purse my photography hobby. I shot this in Tokyo back in 2014 with the Pentax Q7. Maybe at Ueno Station, but I’m unsure. Part of the Deep Blacks collection. I think most cities — bit cities — are exhausting. Boston was too. Even when we were commuting the 70 miles to get home here, it was STILL less exhausting than living full time in the city. When we were young, it was exciting and sometimes fun. As we got older, it was just like being in a constant noisy tunnel. Yeah, I know what you mean. And while Boston is big, it’s tiny compared to Tokyo or New York. I think it’s the “city-ness.” The intensity of everyone so tightly packed rather than the overall size of the place. I lived in NY, Boston, and Jerusalem. All cities … but NY and Boston, though NY is MUCH bigger … are not so different. Jerusalem was very different, though I don’t know if it it all that different these days.